Last Wednesday night I noticed that Patty Scarcelli, a precious young Mom who helps teach our Kids Klub weekly at the Lighthouse Church, was walking in with her two wonderful boys and an over abundance of plastic Easter eggs- preparing for the annual hunt that was soon to begin. As I saw her get ready, I couldn’t help but think of one of my favorite stories that had to do with those very plastic eggs and being a preacher at heart- I couldn’t keep it to myself! I took the initiative and asked her if she would mind if I shared it with her before the evening began. Patty listened graciously and loved it and in turn shared it with the children in her class at the conclusion of their activity. With it being Holy Week, I now will dust it off to one more time share it with all of you! This tale, which doesn’t belong to a rabbit named Peter, illustrates beautifully what Easter is all about. I pray that it would be more than just entertaining and heart warming for you the reader. I pray that it would be just the ticket to help you grab a front row seat for a fresh reminder of what this week is supposed to be all about for the Christian. It just might help you turn your eyes upon Jesus so that you would grab a renewed glimpse of His beautiful face. And perhaps as the old hymn implies, that after making eye contact with the risen Savior, the things of this earth- that so often seem so important- would grow strangely dim in the light of His glory and His grace! The story takes place in the classroom of a Christian school. A young, vibrant and caring teacher whom I will call Miss Thompson loves the class of 26 energetic youngsters that are under her care. She doesn’t just endure her job. She sees it as a privilege to impart both unconditional love and knowledge into her innocent and eager flock of precious children. Miss Thompson was given the extra blessing of having one very challenging student in her class. I’ll call him Billy. Billy was a little slower than the rest of the kids and because of a congenital condition that he was born with probably wouldn’t be on this earth for very long. His parents’ desire was still that Billy be able to experience as much of a “normal” life as possible- even if it meant requiring a little bit more special attention. As trying as that extra attention could be at times, just the sight of Billy’s big smile and his perseverance at always attempting to fit in never failed to melt the heart of Miss Thompson. At the Easter Season that year, Miss Thompson wanted to teach her students the truth that on Resurrection Sunday we remember the awesome fact that Jesus rose from the dead so that those who believe in Him could experience the new life that He has to offer. Buying some plastic eggs, the hopeful teacher handed them out to her enthusiastic students with the assignment that each was to find something that represented “new life” to put in the egg. Miss Thompson gave a bright purple egg to Billy hoping that somehow he would understand the concept and be able to do the task with the other children. 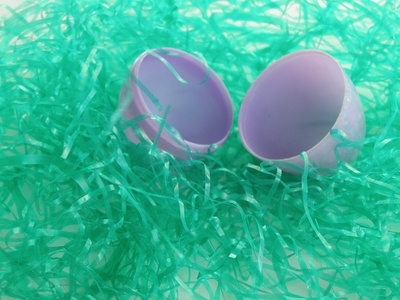 The following day came and everyone wanted to share what was inside their eggs. One student had placed a little flower inside, and another proudly showed off a butterfly to signify that when a caterpillar disappeared in a cocoon, it was so that this wonderful change could take place. Each student bubbled over as they showed off their “new life” symbols. Billy had understood that the greatest symbol of new life was the fact that it was an empty tomb we celebrate every year! We no longer have to make a pilgrimage to a cemetery! The greatest evidence that Jesus is very much alive and well is the reality that there was NO BODY there when Mary and Peter and John went to check out that grave some 2000 years ago! And as the story goes, Billy would graduate to heaven just a few weeks later and on top of that little casket of his at his funeral were 25 empty plastic eggs as a sign that his classmates knew that Billy was now in the Hands of the Author of New Life! It is my hope that this Easter you will find your way to the Cross of Christ where the penalty of your sin was paid for. It took His death to pave the way to give you new life! But don’t get stuck there because by acknowledging and receiving the grace that was given for you, when for you He died, you will be able to celebrate fully the Empty Tomb of Christ! It is there where you will be able to say with confidence that for me He now lives and because He lives- so too will I!!! My heart is now filled because His tomb was then empty!!! And that Charlie Brown is what Easter is all about! I wish for you a hopeful and happy Resurrection Day that is not just about candy in your basket but Jesus in your heart! Visit the Lighthouse Church this Easter and celebrate the truth that the tomb is empty by joining us at 1248 Route 9 South in Cape May Court House. We will have our Good Friday Service at 7PM and our Easter Celebration Services on Saturday Night at 6PM, Sunday Sunrise at 7 AM and Sunday Morning at 9 and 10:45 AM. There will be a Continental Breakfast after all the Sunday Services and a good time will be had by all who come with an open heart!!! Call 465-6690 for more information and I hope to see you this weekend!